Novae Insulae XXVI Nova Tabula. Sebastian Munster. Published by Sebastian Munster, Basel. Woodcut, 1540, (c.1544-45). Image size 10 x 13 3/8″ (25.5 x 34.1 cm) plus margins. Very good condition save for some minor splitting along centerfold. Black & white. LINK. 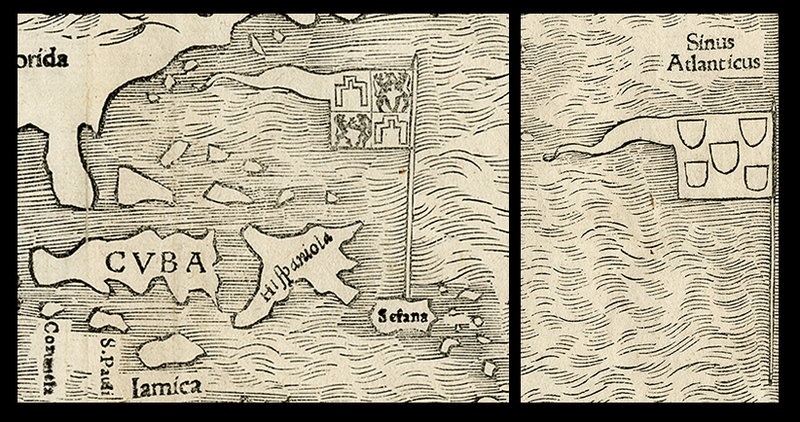 Munster’s map of New World is one of the most important and influential maps of the 16th Century, as it is the earliest to show all of North and South America in a true continental form. This impression is a rare second state of the map, from Munster’s “Cosmography”. In this second state, published c.1544, the title was changed from “Novae Insulae XVII. . .” to “Novae Insulae XXVI . . .” and appeared in only one edition, making it very scarce. Geographically, North America is oddly shaped and depicts one of the great geographic misconceptions. In 1523, Giovanni di Verrazano, a Florentine explorer sailing for King Francis I of France, passed by the outer banks of the Carolinas. He mistook Pamlico Sound for an Oriental Sea that would lead to the Spice Islands, believing that the Barrier Islands were all that constituted North America at the point of the Carolinas. Munster recorded and included Verrazano’s accounts in the greatly successful “Cosmography,” which propagated the myth for many years. Detail of North America, depicting the slim Barrier Islands of the Carolinas as the only land mass between the Atlantic and Pacific Oceans. 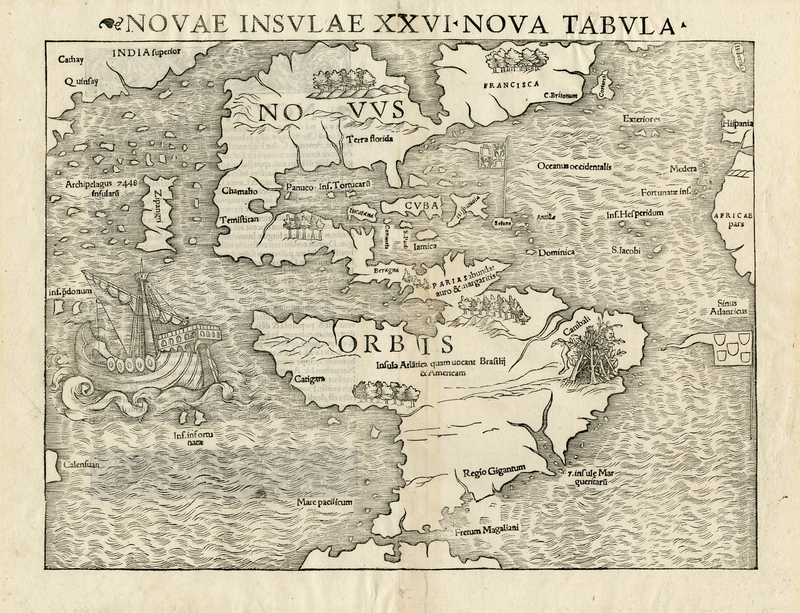 Novae Insulae XXVI Nova Tabula. Sebastian Munster. Published by Sebastian Munster, Basel. Woodcut, 1540, (c.1544-45). LINK. 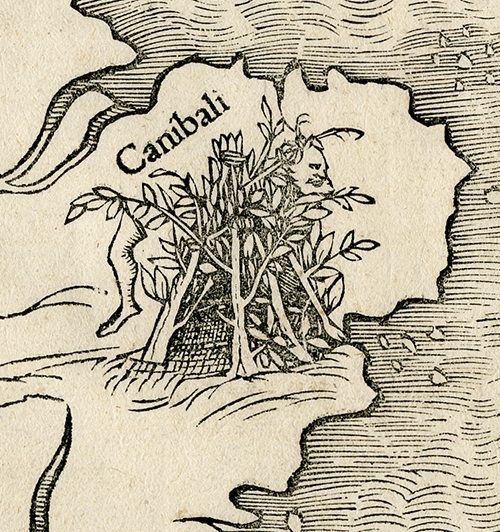 This early map is filled with interesting cartographic details. The flags of Spain (on Puerto Rico) and Portugal (shown in the South Atlantic) depict their respective spheres of influence in the New World. Detail of flag of Spain on Puerto Rico (at left) and flag of Portugal in the South Atlantic (at right). The Yucatan Peninsula is shown as an Island. This is the first map to name the Pacific Ocean (Mare Pacificum). South America is depicted with a large bulge in the northwest and notes that cannibals inhabit parts of it. Detail of northwest bulge of South America, inhabited by terrifying cannibals hiding in bushes. It is also the first map to show Japan (Zipangri), based entirely upon the accounts of Marco Polo and other early travelers. 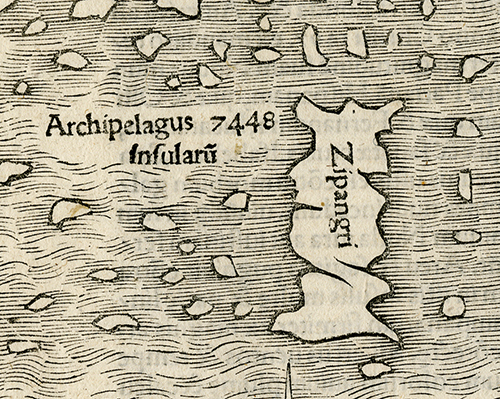 Detail of Japan, marked as “Zipangri” on this map. 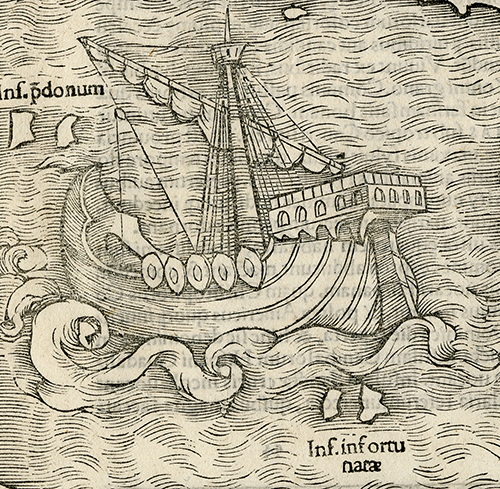 Shown in the Pacific Ocean is Magellan’s ship, Victoria. Detail of Magellan’s ship “Victoria”, the first ship to successfully circumnavigate the world. Overall, this map is as interesting as it is cartographically significant, and would make an impressive addition to any map collection. Come see it in person at our Georgetown gallery, which is open every Tuesday- Saturday.